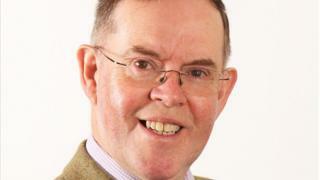 A councillor living 400 miles from his ward is to resign after admitting he was unable to represent his constituents. Donald Adey moved from his Trumpington ward in Cambridge to Scotland a year ago, but remained on the county and city councils. In an email to the BBC, Mr Adey said he had posted his letters of resignation from both on Tuesday. "Representing Trumpington has proved difficult from Fife," he said. Mr Adey, who now lives in Cupar in Fife, had rarely attended council meetings and faced calls for his resignation. Last month he became the last of Cambridgeshire's 61 councillors to agree to give up 1.2% of his allowance - a move of solidarity by councillors in support of staff being forced to take three days' unpaid leave in the face of council cuts. The other councillors agreed to the allowance cut in December, but Mr Adey initially declined. He had claimed £10,000 a year for his county council role and received £4,500 from the city council. Mr Adey represents his ward as an independent councillor after quitting the Liberal Democrats in 2018. He has, in the past, admitted he had a poor attendance record at council meetings in Cambridgeshire. The Local Government Act 1972 states: "If a member of a local authority fails throughout a period of six consecutive months from the date of his last attendance to attend any meeting of the authority, he shall... cease to be a member of the authority." On Wednesday, a county council spokeswoman said: "Councillor Donald Adey didn't attend the full council meeting on March 19 which is the last scheduled meeting he could attend in order to be within the six month attendance rule. "We are contacting [Mr] Adey to see what his intentions are about remaining a member of Cambridgeshire County Council." Mr Adey's resignation will allow his seat to be contested during the local elections in May. Trumpington is the largest ward in Cambridge with more than 9,000 residents.